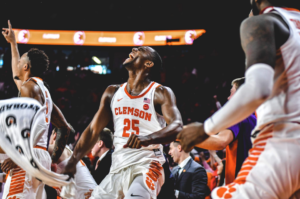 CLEMSON, S.C. — Clemson University men’s basketball finished off a wire-to-wire drubbing of Wake Forest, 64-37, for its second-straight Atlantic Coast Conference victory on Sunday afternoon. The 37 points allowed is tied for the fewest in an ACC game during the Brad Brownell era (37 at Georgia Tech, Feb. 21, 2012). The Tigers (13-8, 3-5 ACC) were led by an ultra-impressive performance by Elijah Thomas. The senior posted his sixth double-double of the season with 23 points and 10 rebounds, while adding in a career-best seven blocked shots. He finished 10-for-11 from the field and 3-for-3 at the charity stripe. While Thomas was the only Tiger to reach double-figure scoring, Clemson posted nine more in the scoring column. Clemson’s defense was stout beginning with the early stages of the opening stanza. The Tigers raced out to a 26-9 advantage – not allowing the Demon Deacons (8-13, 1-8 ACC) past the 10-point mark until the 3:18 mark of the first half. Wake Forest was never able to get into a rhythm with Clemson’s defense locking down two of the Demon Deacons’ starting guards, Brandon Childress and Sharone Wright Jr., and holding them to 0-for-19 from the floor in a combined 55 minutes. The Tigers pushed the pace even further in the second half and led by a game-high 29 points before finishing off the convincing 27-point victory. Clemson returns to the floor on Wednesday, Feb. 6 when it travels to Georgia Tech for a 7 p.m. tipoff in McCamish Pavilion. Notes: Clemson won its second league game in a row … Clemson improved to 25-3 (.893) in Littlejohn Coliseum dating back to last season (last 28 home games) … the Tigers won their sixth in a row over the Demon Deacons … Brad Brownell won his 162nd game at Clemson – just 15 wins shy of tying Cliff Ellis for the most all-time in Clemson history (177) … Clemson held Wake Forest to just 37 total points – tied for the fewest allowed in an ACC game since allowing 37 to Georgia Tech in a 56-37 win (Feb. 21, 2012) … Clemson moves to 41-2 under Brad Brownell when allowing 50 points or less (2-0 in 2018-19) … Clemson’s 10 blocks were a season-best (previous: 8 vs. Charleston Southern – Dec. 18, 2018) … 10 blocks is the most in a game and most in an ACC game for the Tigers since posting 10 against NC State last season (Dec. 30, 2017) … Elijah Thomas posted his 17th career double-double and sixth of the season … Clemson is 13-4 overall when Thomas notches a double-double in his career … Thomas blocked a career-high seven shots … Thomas now has 146 blocked shots in his career … averaging 1.83 blocks per game over his 80-game Clemson career – sixth all-time in Clemson history … Thomas now owns 548 career rebounds at Clemson – just 56 shy of tying Horace Wyatt (1978-82) for 25th on Clemson’s all-time list … Thomas tied his career-high with 10 made field goals … Marcquise Reed moved into 26th all-time in scoring and now has 1,225 points in his Clemson career … with one steal, Reed now has 138 for his Clemson career – just three shy of tying Bobby Conrad (1976-80) for 15th on Clemson’s all-time list … Lyles Davis set a new career-high in points with his first career made 3-pointer … Davis tied his career-high with one steal … Davis also tied his career-high with one made field goal … Trey Jemison tied his career-high with two rebounds … John Newman III set a new career-mark with six points … Newman tied his career-high with two made field goals and set a new career-high with two made 3-pointers … Wake Forest’s 18 first half points were the lowest allowed by Clemson this season … Clemson held Wake Forest to a season-low 23.7 percent shooting … held Wake Forest to a season-low 13.6 percent from 3-point range … held Wake Forest to a season-low 20.6 percent shooting in the second half.